Keratoconus is a progressive eye disease which causes the cornea to thin and become conical over the time. treatments for keratoconus are divided in two, treatments that help to correct the vision problems and treatments for stopping the disease from progressing and getting worse. Because keratoconus is a progressive disease, refractive treatments without stopping the disease's progression, may have short term effect or may not be very helpful for the patient. Only available treatment to stop or slow the progression of keratoconus is Corneal Collagen Crosslinking, developed in Germany in 1998 by Theo Seiler, crosslinking uses ultraviolet light and riboflavin drops to strengthen the cornea's structure. after more than ten years, different methods of this treatment are still under investigation, crosslinking can be combined with refractive surgeries to correct the vision while stopping or slowing the progression of keratoconus. 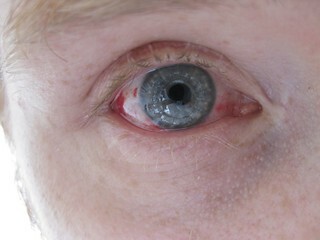 In this technique, riboflavin is dripped onto the cornea and then exposed to ultraviolet light, the light causes the riboflavin to fluoresce, which leads to the formation of bonds between collagen molecules. Corneal crosslinking can also be used in combination with other treatments, to improve the vision while slowing or halting the progression of keratoconus, such as corneal ring segment inserts, laser eye surgery and conductive keratoplasty. Read more: Corneal collagen crosslinking for keratoconus and post-LASIK ectasia. In the early stages of keratoconus, vision problems may be corrected with glasses or soft contact lenses, as the problem progresses, the cornea becomes more thin and irregular in shape and at some point glasses and regular soft contact lenses will no longer help to correct the vision and other treatments will be needed. Rigid gas permeable contact lenses are usually the next preferred treatment option after glasses and soft contact lenses. they are made from a firm and durable plastic that transmits oxygen and they work by replacing the irregular shape of the cornea with a new smooth refracting surface. Getting the right fit is very important with the GP lenses, unlike soft contact lenses which provide better initial comfort, GP lenses require longer time for the patient to get used to it, but with a proper fit and after getting used to the lens, it should be very comfort. however, fitting GP lenses for keratoconus patients may be a challenging procedure, especially considering that keratoconus is a progressive disease and cornea's shape may change over the time. There are also other types of contact lens for keratoconus, such as hybrid lenses and scleral lenses, also some patients may find good and comfort vision by "piggybacking" contact lenses, which means wearing a GP lens on top of a soft lens. Another treatment option for keratoconus or post-LASIK ectasia is intrastromal corneal ring segments (ICRS), such as INTACS1 and KeraRings2, intracorneal rings are thin plastic arcs that can be implanted in the corneal stroma through a small surgical incision on the cornea and they help restore clear vision in keratoconus patients by flattening and repositioning the cornea. 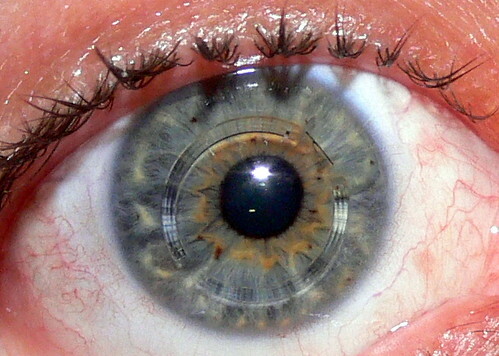 Intracorneal rings may be used for patients with keratoconus who are no longer able to achieve good and comfortable vision using contact lenses or glasses and it is considered as a surgical alternative to corneal transplant, however it can't prevent a corneal transplant if keratoconus continues to progress. Keraflex KXL4 is a new procedure for the treatment of keratoconus which is still under investigation. Keraflex is a non-laser refractive eye surgery that uses microwave energy to reshape the cornea without removing any tissue which is usually a high risk in keratoconus. KXL is an accelerated crosslinking system, in KXL crosslinking time is reduced from one hour to three minutes or less. In this procedure, a single low energy microwave pulse is delivered to the cornea which causes collagen in the cornea to shrink which makes it flatter. the procedure is then followed by KXL crosslinking to improve the stability of the cornea. When keratoconus progresses to a point where vision correction is no longer possible with contact lenses lenses or other treatments, a corneal transplant may be the last resort. about 10% to 25% of keratoconus patients may require corneal transplant, that is usually when there is corneal scarring, extreme thinning or contact lens intolerance. 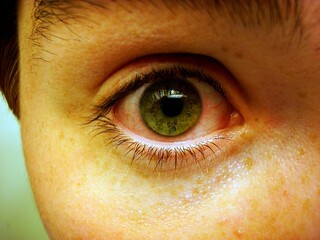 In corneal transplant, the patient's cornea is replaced with tissue from a donor who has recently died and who previously agreed to donate their tissue. full recovery and vision stabilization may take up to a year and patient may still need glasses or contact lenses to have clear vision.